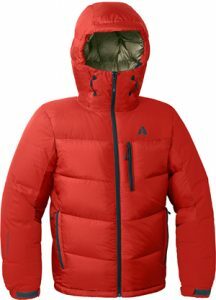 First Ascent, a new line of technical mountaineering apparel from Eddie Bauer, has introduced its Peak XV Down Jacket, undoubtedly the warmest coat I’ve tested. Winter is now the only time of year when I actually feel warm, and I have this new behemoth of a down jacket to thank for that. First Ascent, a new line of technical mountaineering apparel from Eddie Bauer, has introduced its Peak XV Down Jacket, undoubtedly the warmest coat I’ve tested. The Peak XV is stuffed like a Thanksgiving turkey with 850 fill power goose down — premium Northern European goose down, to be exact. All that down packed into a very durable waterproof shell adds up to a hefty parka weighing in at roughly 2.2 pounds. 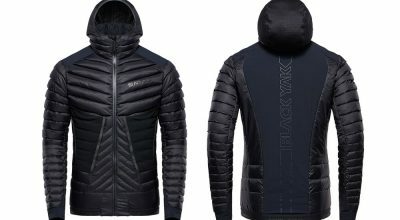 The jacket comes with a stuff sack that packs the coat down to the size of a basketball, but this may not be the piece you’d bring on the lightest and fastest ascents. However, because the coat is waterproof, you can factor it into the overall weight of your bivy set-up: Use the Peak XV to add warmth to a lighter weight sleeping bag. That said, I get colder standing around belaying at crags in the cold months than I do on day/overnight trips into the mountains, where I am mostly on the move. This jacket has made the cruel months of winter cragging not just bearable, but downright enjoyable. My favorite feature is the jacket’s hood, which unlike other coats that skimp here in order to save weight (and get more favorable reviews in magazines), is just as down-stuffed as the rest of the coat. It’s soft and warm, and snuggles up against you like a Christmas puppy. I have two gripes. 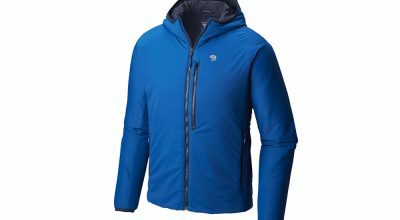 First, the jacket doesn’t have a dual zipper, and cannot be unzipped from the bottom up — a feature that helps us climbers out when we don harnesses, tie knots, rack gear, etc. Second, there are no big pouch pockets inside the jacket. I use those pouches to store climbing shoes, a Thermos, gloves, or anything that I want to keep warm while I belay. There is a small inner pocket that could house an iPhone, but not much else. The two hand pockets outside the coat are fleece-lined, deep and great. So far, this is an impressive start for First Ascent, and I’m looking forward to seeing what other additions they can bring to mountaineering apparel. 850 fill power goose down. Big, fat, warm hood snuggles head and accommodates helmet. Collar blocks face from the cold.